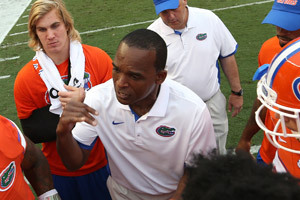 GAINESVILLE, Fla. -- More than 10 months have passed since the day Randy Shannon walked into a room full of reporters dressed in Gators attire, their first glimpse at the University of Miami icon in Florida’s orange and blue. Several snapped photos on their smartphones to share on social media, as if to verify, yes, Shannon really is a Gators assistant. In the time since his official introduction at Florida, Shannon has quietly gone about his business far from the spotlight he once occupied as head coach of the Hurricanes. Shannon was dismissed by his alma mater after the 2010 season. He spent a year working as a TV analyst, returned to coaching in 2012 at Texas Christian, worked on Bret Bielema’s staff at Arkansas in 2013-14, and accepted an offer from first-year Gators head coach Jim McElwain to return to his native Florida in January. 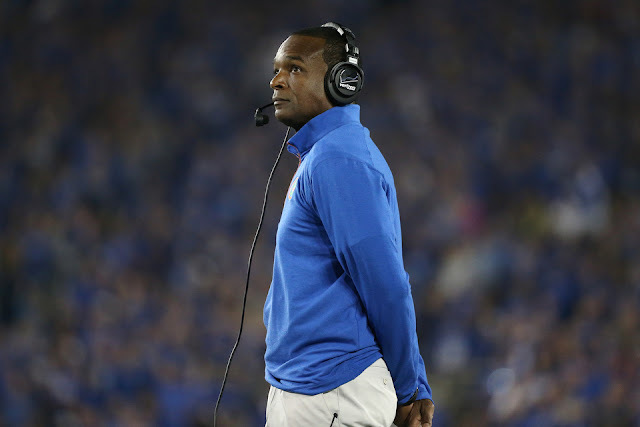 Well-regarded for his character and straight-forward approach by high school coaches around the state, Shannon helped the Gators salvage a respectable recruiting class in his first month on the job, the initial sign he would make a difference in the reshaped program under McElwain. A year ago Shannon never imagined he would be at Florida. Other than for a brief exchange with McElwain during a trip to Alabama the year he spent out of coaching, Shannon had no connection to the former Crimson Tide offensive coordinator. Their backgrounds couldn’t be more different. Shannon grew up in Liberty City, the hardscrabble neighborhood in Miami that took a devastating toll on Shannon’s family growing up. McElwain is from Montana, where he was a two-sport standout in high school who later played at Eastern Washington. Despite the unknowns, the 49-year-old Shannon viewed the opportunity as one that worked professionally and personally. As the No. 12 ranked Gators (10-1) prepare this week to face No. 14-ranked Florida State (9-2), no one on Florida’s staff can match Shannon’s history against the Seminoles. His first matchup against FSU was 30 years ago as a freshman linebacker for the Hurricanes. Shannon was 4-0 against FSU as a player from 1985-88, helping Miami win the 1987 national championship. He spent two seasons in the NFL with the Dallas Cowboys -- drafted by Jimmy Johnson, his college coach -- before returning home to join Miami’s staff as a graduate assistant in 1991, earning a second national championship ring. In his three stints at Miami as a player, assistant coach and head coach, Shannon went 14-8 (including one bowl game) against the Seminoles over 21 seasons. Florida’s unexpected success in McElwain’s first season has turned attention toward the staff he assembled. Shannon, who is the team’s associate head coach/co-coordinator and linebackers coach, and defensive coordinator Geoff Collins are reportedly drawing interest as potential candidates to become UCF’s next head coach. McElwain made no secret of the importance of Shannon’s hire when he brought him on board. Once Shannon got settled and evaluated the players Florida’s defense had returning, he was confident the Gators could have one of the top units in the country. The Gators have lived up to those expectations, ranked sixth nationally. Shannon also sees the impact McElwain’s approach has made on a team that many projected to win no more than seven games. The players say Shannon has played an important role, too. At his introductory press conference at UF, Shannon said he would like to be a head coach again one day. But he also said he doesn’t know when, or if, that will happen. Like he tells his players to, Shannon keeps an open mind. He has enjoyed the transition to Florida and the surprises that have come with a turnaround season for the program.